“It is two years since our last visit to the Kakuma Refugee Camp, so our most recent visit of last week was very timely. The original plan was for Pastor Sam Oluoch and me to travel together. However, due to the fact that Sam had been outside the country and returned straight into teaching at KReST one week before our journey, it was decided that Pastor Emmanuel Temba take Sam‟s place. (Emmanuel has been working side-by-side with Sam in the new Nairobi church plant). Travel to Lodwar and then on to Kakuma is always difficult and a bit dangerous. It was extremely challenging on this trip, due to a government countrywide crackdown on public transport which is not road-worthy. Finally arriving in Kakuma, thoroughly tired and dusty, we were met by our hosts Babale and Pastor (Evangelist) Stephen of Unity Church and arranged lodging. 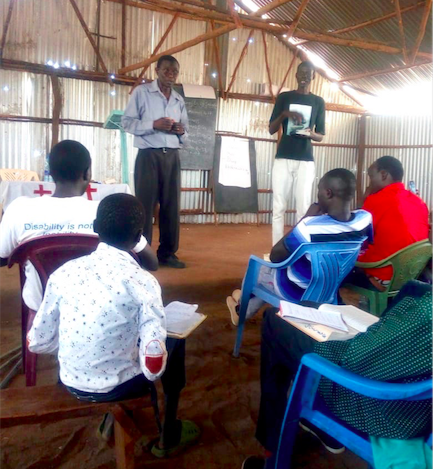 The following morning our hosts came for us and, before heading to the meeting place at the Refugee Camp, we all went to the Refugee Administrative Offices where we needed to obtain permission to enter and conduct our two-day preaching and teaching ministry. We were interrogated for some time and finally required to make a written application and, after more waiting, we received our official permission to enter the camp and hold our meetings. We rushed to the church building, about twenty minutes motorbike ride, where the delegates were patiently waiting and without delay we embarked on our mission. The theme of our conference was “Preaching Salvation.” I began the sessions by teaching on “Why and From What do we need to be Saved?” Pastor Emmanuel then led the second session on “Salvation is of God from Beginning to End‟. We did four sessions on the first day of the conference. At the end of each session we answered questions from delegates who were pastors, evangelists, and leaders in various ministries of different churches. In addition to the South Sudanese, we also had refugees from the Oromo people of Ethiopia. On the second day, we straightaway continued with the sessions. Conscious that our time was limited among these brethren, tea and lunch breaks were kept short enough. This final day was unique, particularly with the attendance of a thirteen year old boy called Aganyang’ Simon. This boy will be moving to grade seven next year. He stays in the camp with his mother and attends a local primary school while his father lives in South Sudan with a second wife. So what is so special with Aganyang’? This boy (photo below left) has an amazing grasp of the Bible. This is evident both in the depth of questions he asked and the answers that he gave. We took very keen interest and talked more closely with him. 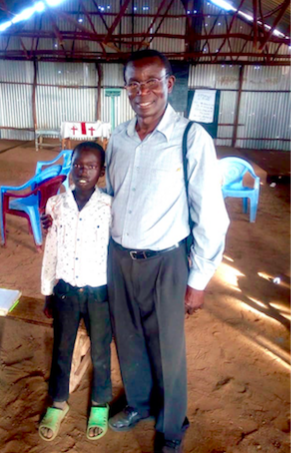 He said his deep desire is to finish school and become a pastor so that he can preach and teach his people (the Sudanese) to fear God and abandon ancestral traditions! He certainly needs to be taught more of the way of salvation through the Lord Jesus Christ alone by faith alone. We urged Babale and Pastor Stephen to provide more spiritual help for this young lad. 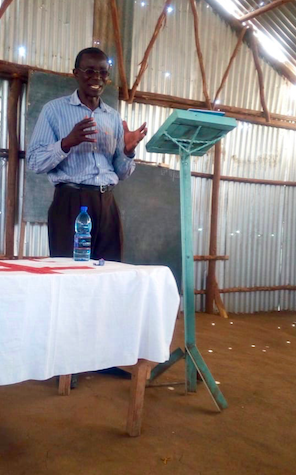 While on the one hand, Aganyang’ deeply warmed our hearts with his knowledge of God’s word and his desire to be a pastor and turn his people from sinful practices to God. On the other hand, we were extremely saddened by the general lack of biblical knowledge among so many of the delegates. I was drawing Old Testament illustrations as I taught from John 1:29 “Behold the Lamb of God that takes away the sin of the world.” When it was obvious that they were not following my illustrations, I asked passionately why there was such ignorance of very significant OT stories. Their sad answer was: 1) Yes, they began to learn such OT stories some years ago in Sunday-school back in South Sudan. But then war broke out and people ran for their lives and ended up in the Refugee Camp. After the stress of survival, much of their former learning had been forgotten. 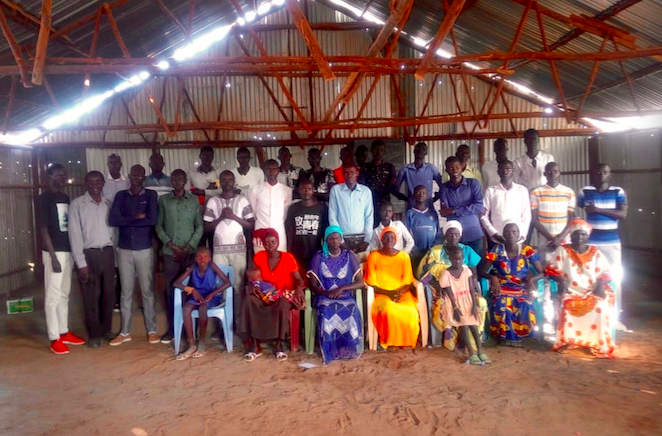 2) The Murle people, who were the majority at the two-day conference, only have New Testament in their language, so the OT is largely unknown to them! 3) This was the very first conference of its kind for this Murle community in the camp and therefore everything was new to them.